AUSTIN, Texas -- Valentine's Day is quickly approaching, and people across the country are looking to Google for some guidance on the holiday. Texas most interested in "Dirty Valentine's Poems." 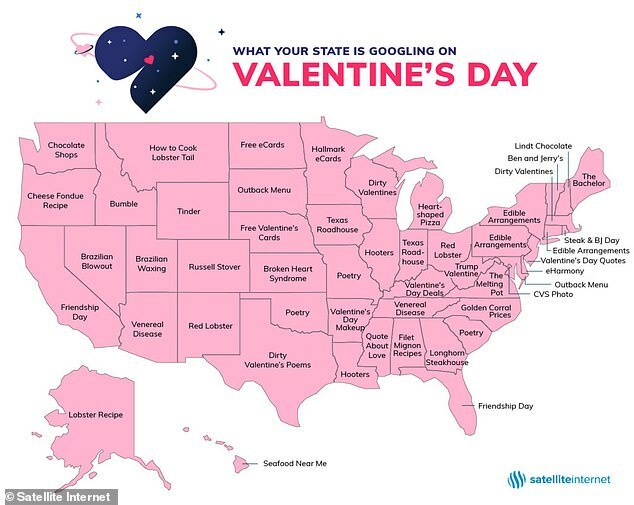 Satellite Internet made a map of all of the top Valentine's Day-related searches in each state. Some of the top searches are food-related such as “Golden Corral Price"s in North Carolina or a “Lobster Recipe" in Alaska. Maine, Florida and California show their singles pride with “The Bachelor” and “Friendship Day, respectively. Residents in Idaho and Wyoming seem to be preparing for next year by looking up dating apps. Residents in Missouri and Oklahoma are searching how to charm their significant other through poetry, while The Lone Star State takes a more interesting path with the top search being "Dirty Valentine's Poems."